Eight students can now enjoy bragging rights for leaving their mark on the University and helping to make the future. 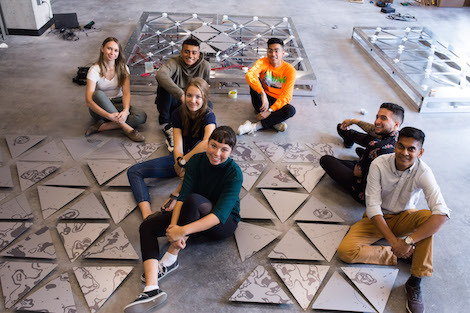 Since early September, the brand-new STEM Complex has been home to two interactive works of art that these students created and constructed. They built the pieces – Surface Tension and Equilibrium – as part of the STEAM project, which combines the arts (“A”) with the STEM disciplines (science, technology, engineering and mathematics). Talk about a dream summer job! 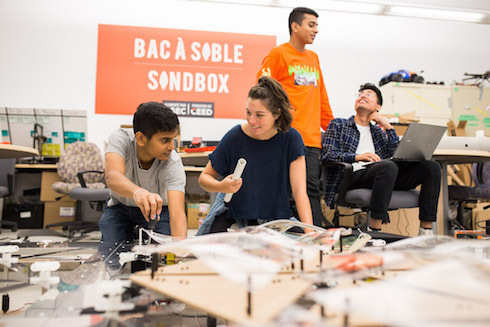 In March 2018, engineering students Devansh Shah, Keshav Deeljur, Marc Leblanc and Elliott Carrière won the Makerspace Challenge, which gave them the opportunity to produce prototypes for interactive works of art, and then build and install two of the creations in the STEM Complex in time for its September opening. Visual arts students Sarah Hodgson, Lucy Oulanova, Hannah Lacaille and Elizabeth Lebedev were selected from among many candidates to join the two teams. Together, they worked tirelessly to complete the project in four months. This major interdisciplinary initiative allowed participants to step outside their respective fields and taught them specific lessons. The art students are now aware of the "moments of force" affecting a structure, and the engineering students now consider the visual impact of the technical solutions they come up with. Obviously, such an ambitious project demands a lot of monitoring and coordination, both by the professionals involved in constructing the STEM Complex and the two student teams. In the process, participants gained team management and project management skills. 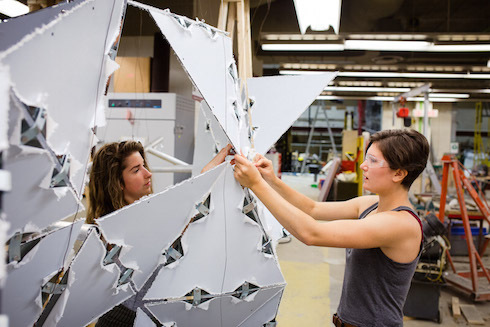 Elizabeth Lebedev and Hannah Lacaille assemble Equilibrium. In science, “equilibrium” refers to a state of balance between two opposing forces, which is exactly what this structure represents, activating as people climb the staircase over which it hangs. Bonus: the work supports the STEM Complex architects' goal of encouraging people to use the immense staircase reaching every floor of the building. Students: Elliott Carrière (civil engineering), Hannah Lacaille (visual arts), Elizabeth Lebedev (visualarts), Marc Leblanc (civil engineering). Students finding a summer job in their field are often the exception to the rule. Sarah Hodgson, who is interested in a career in public art, was delighted by the opportunity to apply the theory she learned in class to a real-life setting, and to get a sense of what it would mean to earn a living as an artist. The same was true for engineering students like Devansh Shah, who discovered a new dimension to his studies through the project. Other students – Laura Weller (biology), Sarmad Nomani (computer engineering) and Ali Sanaknaki (computer science) – also volunteered to work with the Surface Tension team simply for the experience. Alumnus Mohamed Hassan (B.Sc. Mechanical engineering'18), who was a Makerspace Challenge participant, was also a volunteer consultant. For him, the opportunity was too good to pass up. He jokes that there should be 20 projects like this every year. The project also offered a golden opportunity to work with engineers, architects, contractors and the career artists involved to achieve high-quality results. This professional supervision was exciting and rewarding. Keshav Deeljur, Sarah Hodgson, Devansh Shah and Sarmad Nomani work on the Surface Tension prototype. This wall representing a wave is composed of triangles whose surface reacts to the movement of passersby by undulating. Inspired by the Ottawa River, the work illustrates the interconnectedness of disciplines through the operational cohesion of various components, each representing a discipline: visible mechanisms for engineering, delicate aerial collages for art and illustrations based on enlargements of micro-organisms collected from the Ottawa River to represent science. 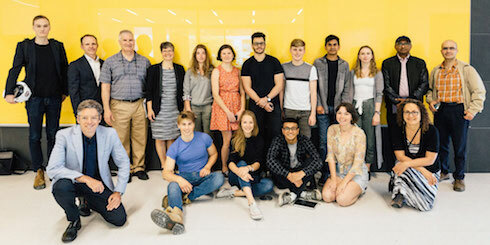 Students: Mohamed Youssef Benmchich (civil engineering), Elliott Carrière (civil engineering), Hannah Lacaille (visual arts), Elizabeth Lebedev (visualarts), Marc Leblanc (civil engineering). None of this would have been possible without Hanan Anis, holder of the Chair in Entrepreneurial Engineering Design and Makerspace Challenge supervisor; Chantal Rodier, director of the STEAM project and Campus Public Art consultant; and Lorraine Gilbert, director of the Department of Visual Arts. The result of an unprecedented collaboration, this interdisciplinary pilot project required a lot of work but also brought about new approaches to inter-departmental collaboration, with lasting results. In addition to offering students an incredible experience, the project will leave the University community with interactive works of art that enhance the new STEM Complex and the campus as a whole. Join us for the STEM Complex Open House on September 20 from 12 p.m. to 2 p.m (150 Louis-Pasteur). STEAM project team: Back row: Dan McTavish (Architect, Perkins + Will); Matt Johnston (Project lead, Perkins + Will); Claudio Brun del Re (Chief Architect, Facilities); Chantal Rodier; Elizabeth Lebedev; Hannah Lacaille; Mohamed Hassan; Marc LeBlanc; Keshav Deeljur; Lucy Oulanova; Samiddha Aryasinghe (Chief, Major Projects, Facilities); Charles Azar (Subject Matter Expert, Architecture, Facilities). Front row: Andrew Frontini (Design Principal, Perkins + Will); Elliott Carrière; Laura Weller; Devansh Shah; Sarah Hodgson; Hanan Anis. The Surface Tension team takes a break from assembling their work of art in the STEM Complex.